US futures are flat after a torrid 24 hours, which saw European and Asian stocks decline led by China, HK and South Korea, as weak economic data, a Fed rate hike and U.S. tariff threats spooked emerging markets and sucked the life out of a rally spurred by the Chinese central bank unexpectedly deciding not to follow the Fed in raising interest rates amid what Rabobank said was "shockingly weak" Chinese data as the global economy is now on its last legs. Of course, the looming ECB rate decision, in which Draghi may announce the beginning of the end of QE, is adding another layer of uncertainty (full ECB preview here). Whatever Draghi says, the market is confident that it will be hawkish and is bidding up the Euro this morning. As a result, the most likely outcome is that the Euro will tumble especially with the Fed on pace to hike 2 more times in 2018 blowing out rate differentials out of the water. Going back to the Fed, it is only appropriate that most benchmark stock gauges retreated after Powell unveiled a picture of sterling health for the US economy, suggesting that despite the actual data, the Fed expects the economy to overheat (for a while), with Powell talking up the U.S. growth as the Fed raised rates and hinted at a total of four hikes in 2018, while China’s central bank unexpectedly failed to follow the increase. Asian shares taking their cue from Wednesday’s weak U.S. session and deepening recent losses. 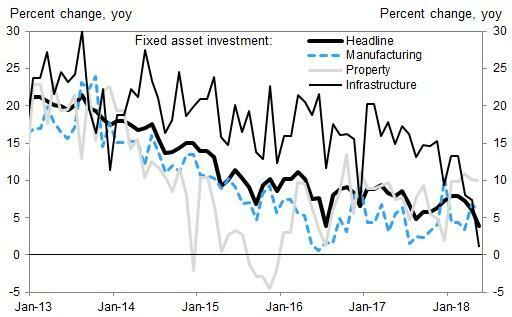 As previously noted, abysmal Chinese economic data which saw industrial production, retail sales, and fixed investment miss across the board, did not help. sentiment. In a whiplash session, the Shanghai Composite Index down 0.2%, after first rising as much as 0.5% following the PBOC decision not to hike rates in line with the Fed, and then fell as much as 0.6% in wake of the disappointing Chinese economic data. Adding to the Chinese gloom, President Trump threatened to “strongly” confront China on trade with new tariffs expected as soon as Friday. In Asia, Australia's ASX 200 (-0.1%) and Nikkei 225 (-1.0%) opened lower although were off lows with strength in telecoms helping Australia to briefly return flat, while KOSPI (-1.3%) was the worst performer as it also took into account the weakness during the prior day’s market holiday. Elsewhere, Hang Seng (-0.9%) was downbeat after the HKMA hiked rates in lockstep with the Fed and the Shanghai Comp. (-0.2%) traded choppy with early support seen after the PBoC refrained from increasing its repo rates. However, upside in the mainland was later pared amid prospects of looming US tariffs on China and following disappointing Industrial Production and Retail Sales data, in which the latter grew at its slowest pace since 2003. Europe's Stoxx 600 Index followed Asia's example and slumped pressured by the stronger euro, while American equity futures erased a drop to trade little changed. European equities declined as traders are tentative ahead of the ECB’s monetary policy decision, with moves dictated by equity specific stories. Rolls Royce (+3.0%) is leading the gains in the Stoxx 600, after the announcement that 4,600 jobs will be cut from the company in order to save GBP 400mln. Amid a market divided on whether President Draghi will announce an end date for asset purchases, euro-area bonds slipped. Emerging-market currencies attempted to form a short-term bottom, while Treasuries advanced and oil consolidated recent gains. The 10Y TSY yield declined one basis point to 2.95 percent, the first retreat in a week. Germany 10-year gilts rose 2bps to 0.50 percent, the highest in more than three weeks, while Britain’s 10-year yield increased 1bp to 1.369 percent. Finally, Italy’s 10-year yield climbed four basis points to 2.85 percent. In commodities, brent dropped 0.2% on the day, with WTI +0.1% on a softer USD. Traders are also looking ahead to developments that may come from the Saudi-Russia meeting on the sidelines of the World Cup which kicks off today. In the metals scope, gold is up on the day hitting 2 week highs as investors flock to safe havens ahead of the ECB’s rate decision, as well as having support offered by a softer USD and trade concerns. The yellow metal is up 0.2% on the day. Copper has fallen to a near one week low after weak Chinese industrial data. Steel is in the green for the 3rd straight session after China has said it will introduce a new capacity limit in certain areas. Asia stocks traded softer as the region reacted to the FOMC which hiked rates by 25bps to 1.75%-2.00% as expected and forecast a total of 4 hikes this year vs. Prev. forecast of just 3 increases, while the statement also contained a more hawkish undertone regarding growth and rates. As such, ASX 200 (-0.1%) and Nikkei 225 (-1.0%) opened lower although were off lows with strength in telecoms helping Australia to briefly return flat, while KOSPI (-1.3%) was the worst performer as it also took into account the weakness during the prior day’s market closure. Elsewhere, Hang Seng (-0.9%) was downbeat after the HKMA hiked rates in lockstep with the Fed and the Shanghai Comp. (-0.2%) traded choppy with early support seen after the PBoC refrained from increasing its repo rates. However, upside in the mainland was later pared amid prospects of looming US tariffs on China and following disappointing Industrial Production and Retail Sales data, in which the latter grew at its slowest pace since 2003. Finally, 10yr JGBs saw mild gains amid the risk averse tone although upside was contained following the BoJ Rinban announcement in which the central bank reduced its purchase amounts in the belly. PBoC injected CNY 70bln via 7-day reverse repos, CNY 50bln via 14-day reverse repos and CNY 30bln via 28-day reverse repos, for a net daily injection of CNY 70bln, while the PBoC kept its reverse repo rates unchanged despite the Fed hike. European equities are lower as traders are tentative ahead of the ECB’s monetary policy decision, with moves dictated by equity specific stories. Rolls Royce (+3.0%) is leading the gains in the Stoxx 600, after the announcement that 4,600 jobs will be cut from the company in order to save GBP 400mln. Volkswagen (-0.5%) is pressuring the DAX (-0.3%) as the company was handed a EUR 1bln fine over the emissions scandal. GlaxoSmithKline (+0.7%) is propping up the FTSE 100 as the co. reported positive top-line results for its Gemini 1&2 studies, as well as competitor Mylan failing in a generic competitor for its blockbuster asthma treatment. This however is negated by the effect of a rising GBP following retail sales beats, with the FTSE 100 the underperforming bourse (-0.7%). In FX, the DXY index and Dollar overall has settled lower after some volatile moves in wake of the FOMC and despite an upgrade to dot plot rate projections from 1 more hike this year to 2, with some market observers pointing to the more dovish elements of the latest policy pronouncements, like the marginally smaller than forecast OIER tweak and ongoing symmetry around the inflation target, along with the various trade/tariff rifts between the US and other nations of course. Whatever the rationale, the DXY has retreated further from recent peaks just shy of 94.000 to sub-93.500 and remains on the back foot ahead of the ECB and US retail sales data later today. GBP: Exceptionally strong UK retail sales data has boosted the Pound with Cable up to 1.3445 and Eur/Gbp back under 0.8800 as flagging BoE rate hike prospects get a partial reprieve. However, macro developments over the weak as a whole have been somewhat mixed and do not really change the near term outlook materially. JPY: From zero to hero, or at least one of the main G10 beneficiaries of the Greenback’s post-Fed about turn, as the headline pair retreats sharply from Wednesday’s circa 110.70 highs to sub-110.00 and from a chart perspective back down below a key fib level (110.62 – 76.4% retracement of 111.39-108.12 decline). Tech bears are now eyeing another fib at 109.62 (50% of the rally from 108.12 to 110.85), but the next fundamental driver for the Jpy could come via the BoJ on Friday and there are also mega option expiries to consider around the big figure (3bln from 109.90-110.05). In commodities, in energy markets, Brent is down 0.2% on the day, and its US counterpart +0.1% on a softer USD. Traders are also looking ahead to developments that may come from the Saudi-Russia meeting on the sidelines of the World Cup which kicks off today. In the metals scope, gold is up on the day hitting 2 week highs as investors flock to safe havens ahead of the ECB’s rate decision, as well as having support offered by a softer USD and trade concerns. The yellow metal is up 0.2% on the day. Copper has fallen to a near one week low after weak Chinese industrial data. Steel is in the green for the 3rd straight session after China has said it will introduce a new capacity limit in certain areas. I think they’ll beat Germany in the final and France will finish 3rd and Spain 4th. England (who have actually only won 1 of their last 8 World Cup matches!) will likely lose on penalties in the quarter final and lots of people will cry. Actually I haven’t worked out if my top 4 ordering is possible or realistic given the groups but that’s never stopped me making research predictions in the past. Please feel free to send in who you think will win and we’ll do a bar chart of the distribution of answers in tomorrow’s EMR. One word answers are fine unless of course you expect Costa Rica, South Korea or Saudi Arabia to win and then you’ll need two. The event officially kicks off this afternoon with hosts Russia taking on Saudi Arabia at the Luzhniki Stadium in Moscow. It’s not exactly a heavyweight opening tie given that these are the two lowest ranked sides in the tournament with a combined FIFA ranking of 137 but at least they were kind enough to schedule it after the ECB press conference finishes. I’m actually writing this coming home from a late dinner so I’ll leave you in the capable hands of Craig and Jeff for the rest of the EMR today. See you tomorrow. Over to them. As Jim discussed above the highlight today is the supposed ‘live’ ECB meeting. We’ll preview that shortly but firstly to the Fed where last night as expected the FOMC raised rates by 25bps but the bigger story was the overall fairly hawkish message. Indeed the median dot for this year nudged up to 4 from 3 while the 2019 dot also moved up to 3 hikes which is a bit more of a surprise. Forward guidance was changed to omit language saying that the fed funds rate would remain “for some time” below longer-run levels while inflation language was also upgraded to remove “carefully monitoring”. One interesting point was that the Fed also marked down unemployment rate forecasts but didn’t lower NAIRU which is making for an interesting debate amongst economists. As for Fed Chair Powell, well he confirmed that there will now be a press conference after every meeting beginning next year. He rightly downplayed any policy read-through but it could provide greater flexibility for a faster pace of rate hikes next year if inflation begins to respond to the tightening labour market. The tone of the rest of his conference felt like one where by the Chair was seeking to downplay the hawkish signal despite the dots moving. Indeed he said that the Fed is “not ready to declare victory on inflation” and shortly after when questioned on the neutral rate, answered in a way which kept the Fed’s options sufficiently open without committing at all. DB’s Peter Hooper also believed the meeting and Fed forecasts were more hawkish than expected. He added that Mr Powell didn’t seem to be too concerned about downside risks associated with trade policy or Italy. Overall, Peter and his team believes four rate hikes (2 more) this year seem pretty well baked in and continue to expect four more rate hikes next year. Refer to his note for details. As for markets, well despite the hawkish bias moves were hardly exaggerated. Perhaps this reflects the fact that the hurdle to an even more hawkish Fed is a lot higher now than the one just passed. Looking across the yield curve the biggest move was at the short end with 2y yields finishing 2.9bps higher at 2.569% although a small rally for this morning has pared much of that. 10y yields by comparison finished just 0.6bps higher at 2.967% after passing but failing to hold above 3%. The 2s10s spread fell below 40bps for the first time since September 2007 while at the long end 30y yields actually fell slightly (-0.8bp to 3.087%). The 5s10s spread is also at a miniscule 14bps. It’s worth noting that Powell again acknowledged the yield curve but merely said that it’s something people are talking about a lot”. Meanwhile, equities suffered from a bit of a late collapse which might have more to do with the Trump interview headlines which came out post the Fed suggesting that he’ll confront China “very strongly” over trade in the coming weeks and that China “could be a little bit upset”. The WSJ also reported that the US plans to announce a final list of tariffs targeting $50bn of Chinese goods as early as Friday, with implementation subject to Trump’s approval. The S&P 500 fell for only the second time in 9 sessions (-0.40%), with only consumer discretionary stocks in the black. The Dow (-0.47%) and Nasdaq (-0.11%) also closed lower. In other markets EM FX was weaker although we will likely have to wait for today to see the full extent. Overnight in Asia the tone is a bit more negative with the Kospi (-1.63%) playing a bit of catch up as trading resumed today, while the Nikkei (-0.49%), Hang Seng (-0.62%) and ASX 200 (-0.14%) are all down. The Shanghai Comp (-0.28%) has swung about a bit after the PBOC refrained from immediately lifting the cost of reverse repo agreements following last night’s Fed rate hike but then China’s May activity indicators disappointed across the board. More details on that data further down. In a busy overnight session, the BoJ has also announced that it is lowering purchases of 3-5y JGBs. The Yen is slightly stronger at the margin although JGBs haven’t moved much. Moving on. As a side note, last night’s Fed hike means that we’ve now seen a total of 15 rate hikes in 2018 from the 23 biggest central banks around the world for which we have data for. This compares to just 7 rate cuts. So the ratio of hikes to cuts is now 2.1x which is the highest since 2011, when it was also 2.1x. Despite being less than 50% of the way through 2018 the 15 hikes are only 5 less than the total in 2017 and more than 2016 (14 hikes) and 2015 (10 hikes), in line with 2014 (15) and more than 2013 (9) and 2012 (1). In fairness a lot of the 2018 story has to do with EM central banks tightening to help combat various currency crises. If we look at developed market central banks only which we count as 9 of them, then we’ve only had 3 hikes (2 from the Fed and 1 from the BoC). Still, that compares to 0 cuts but there’s still a way to go to match the 2017 ratio of 7 hikes to 0 cuts from developed market central banks. Coming back to the ECB then, as DB’s Mark Wall noted in his preview of the meeting, Peter Praet’s speech last week means that no one will be able to claim surprise if the ECB announce the end of QE today. Mark adds that it is difficult to dispute the signal in Praet’s comments but the question is not whether an exit decision is close but what could stall the decision temporarily. His note which you can find here (link) runs through two dovish scenarios. In the first scenario the ECB judges the exit criteria to be met but stalls the exit decision for a couple of months to confirm the criteria are being met sustainably. In the second the ECB stalls for input from the internal committees on the post-QEpolicy stance. Mark notes that the ECB has tended to smooth exit decisions with dovish counterbalances and in his speech Praet underlined again the importance of reinvestments and a recalibration of forward guidance post-QE. For choice Mark thinks the QE exit decision will be made in July but caveats that it’s a very close call. Irrespective, he still believes that QE will end in December after a taper in Q4 followed by a first policy rate hike in June 2019. Anyway we’ll know more this afternoon with the meeting due at 12.45pm BST followed shortly after by Mario Draghi’s press conference. With regards to other markets yesterday, well it was very quiet in Europe which isn’t a great surprise given most investors were sitting on the sidelines pre-Fed. The Stoxx 600, DAX and CAC finished +0.19%, +0.38% and -0.01% respectively. The FTSE MIB (+0.44%) outperformed and closed higher for the third consecutive day – the first time in a month that has happened. Sovereign bonds were a bit stronger at the margin. 10y Bunds finished 0.9bps lower at 0.478% while BTPs finished 4.7bps lower at 2.795%, in part as Italy’s new EU Affairs Minister Paolo Savona said the Euro was “indispensable”. It’s also worth noting that BTPs passed a heavy supply day with reasonable ease yesterday. Elsewhere EM FX was again fairly calm pre-Fed, certainly at least relative to recent weeks, although the exception continues to be Turkey where the Lira weakened another -1.09%. It’s now weakened -3.89% in the 3 days this week while 10y yields also rose 8.4bps. Keep in mind that Turkey’s central bank has jacked up rates by 500bps recently. As we’ve said in recent weeks the EM issues haven’t yet spread to other asset classes but it’s certainly bubbling below the surface. Meanwhile the Oil complex was slightly stronger yesterday with WTI up +0.80% from the intraday lows and it’s worth noting that Oil could be back in the spotlight today with Russia President Vladimir Putin due to meet Saudi Crown Prince Mohammed bin Salman with the pair planning to discuss the OPEC accord and Oil markets. So worth watching out for any headlines. The OPEC-Russia oil exporting group is then scheduled to meet next Friday. Away from markets, the most significant data print yesterday was the May PPI report in the US which was mostly a mixed bag. Headline PPI surprised to the upside at +0.5% mom (vs. +0.3% expected) however the ex food, energy and trade services reading was softer than expected (+0.1% mom vs. +0.2% expected). Notably, healthcare PPI (which is used by the BEA to construct the health care services series in the core PCE deflator) was even softer at -0.26% mom – the biggest fall since October 2014. In contrast, the inflation data in the UK yesterday was pretty much bang on expectations. The May headline and core CPI were both in line and steady on month on month, at +0.4% mom and +2.1% yoy, respectively. Meanwhile, the May RPI edged down 0.1ppt from April to an in line print of +0.4% mom while the core PPI was also in line at +0.2% mom, although prior downward revisions led to a lower than expected annual growth of +2.1% yoy (vs. +2.5% expected). Elsewhere, the Euro zone’s April IP was weaker than expected at -0.9% mom (vs. -0.7% exoected), leading to annual growth of +1.7% yoy, down from +3.2% previously. Finally in China this morning, as noted at the top the activity data was pretty much softer everywhere you look. May retail sales expanded at a slower than expected rate of +8.5% yoy (vs. +9.6%) and fell from +9.4% in the month prior. Meanwhile, industrial production was also below market (+6.8% yoy vs. 7.0% expected) and down two-tenths from the month prior, and fixed asset investments posted the slowest increase since 1999 (+6.1% yoy vs. +7.0% expected and in the previous month), weighed down by investments in the public sector. Looking at the day ahead now, the focus is obviously on the ECB with their latest monetary policy meeting due in the early afternoon, followed by President Draghi's press conference. Prior to that though we are due to get final May CPI revisions in Germany and France. In the UK May retail sales data is due while in the US the main data release is also the May retail sales report. The May import price index reading is due too in the US along with weekly initial jobless claims and April business inventories data. And for supporters of Russia and Saudi Arabia, good luck tonight!